As you can well imagine, given the great variety of species of fish and habitats, not every fish eats the same food. The feeding habits of most aquarium fish are known almost exactly as a result of extensive observations by numerous scientists of fish both in aquariums and in the wild. You too can learn more about your own aquarium fish at home by closely studying their feeding habits. How much protein, fat etc. do aquarium fish need? The first group consists of fish which hardly ever come into consideration as aquarium fish because of their predatory habits (they eat other fish). They must be fed almost exclusively with live fish. Most aquarium fish belong to one of the two groups of omnivorous or herbivorous fish, whereby some form an intermediate group. To find out which fish belongs to which group, either carry out your own observations or consult some of the comprehensive specialist aquarium literature. Omnivorous fish need food containing 45% crude protein, whereas herbivorous fish need considerably less, namely 30 35%. If primarily vegetable protein carriers (e.g. soya) are used, the protein content for herbivorous fish may also amount to up to 40%. The fat content should be 5% for omnivorous fish and 3% for herbivorous. In their natural habitats, fish often eat foodstuffs with much higher fat content. However, because movement in an aquarium is much more restricted than in the wild, high fat content should be avoided in feed for aquarium fish. Otherwise there is a risk of fatty degeneration of the liver. The need for carbohydrates is inversely proportional to the protein content. Provides the fish with enough room to live and to move in the aquarium. Sufficient room to swim prevents fatty degeneration of the liver. Herbivorous species need more carbohydrates in their feed than omnivorous ones. With a higher proportion of carbohydrates, the herbivorous species also obtain more fibre which is important for their digestive systems. The fibre content for herbivorous species should be between 3 and 5% and for omnivorous species about 2%. The entire digestive system of the fish has adapted itself over the course of evolution to the composition of the food, using it to the optimum. For example herbivores have long intestines, ideally suited to a vegetable diet which is difficult to digest. Omnivorous or meat-eating fish have much shorter intestines suited to their easily digested diet which is rich in protein. Incorrect feeding may lead to serious disturbances of the digestive system. The intestines run in several coils through the body. The intestines of meat-eating fish are short and straight, whereas those of plant-eating fish are long and twisting. All JBL flaked feeds are designed to guarantee the correct nutritional value for the specific group of fish. Exact details may be found in the descriptions of the individual types of feed on pages 16 20 in this brochure. The otocinclus types of herbivorous fish. They are excellent consumers of algae and �graze� on algae beds on plants and stones. Why different forms of feed? The shape, size and position of the mouth on the body of the fish is an important indicator showing above all where and in what form the fish is accustomed to take in food. Butterfly fish are solely surface fish, fetching their food mainly from the surface. Characine are typical representatives of the middle water levels. They are amongst the most popular aquarium fish and normally live in large shoals. The peace-loving catfish are a great enhancement to any mixed aquarium. They consume leftover food off the floor and are also good eaters of algae. 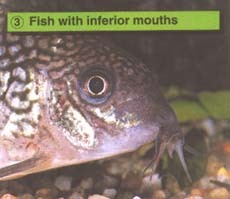 The first group contains fish whose mouths slope upwards (e.g. the galaxidae, butterfly fish). 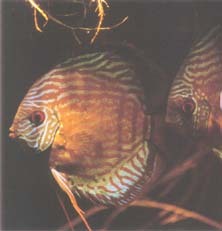 The back line of these fish is straight and, as surface fish, they are adapted to feeding at the water's surface. 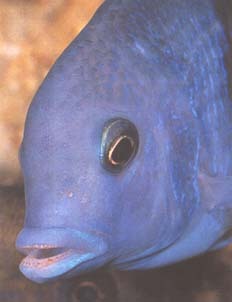 Fish with anterior mouths have horizontal mouths pointing forwards and a body equally curved at the top and bottom (e.g. characine, barbels). These fish live in the middle water levels and feed there. 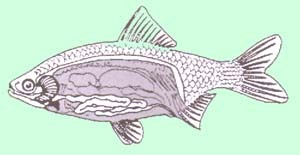 Fish with inferior mouths usually have bearded mouths, sloping downwards and a body which curves upwards, with a relatively flat belly line (e.g. armoured catfish, loaches). These fish feed on the floor, searching with their beards for food. There are many intermediate forms between groups 1 and 2. Occasionaily fish from the middle water levels will look for food on the surface of the water and surface fish will look at lower levels. However, ground feeding fish are reluctant to leave their "realm" to look for food in open water. Surface fish require feed which floats on the surface of the water e.g. JBL Novo flaked feed. Some of the feed flakes will sink slowly down and may therefore also be eaten by fish in the middle levels. In the wild surface feeding fish also eat many insects which fall onto the surface of the water. Natural feed from the Novo range, e.g. JBL NovoFil, JBL NovoDaph etc, is composed of feed organisms in their natural state, which ideally meet this requirement. The fish feed tablets JBL NovoTab were developed for fish of the middle levels and for ground feeding fish. The tablets can be dropped to the bottom, thus reaching the more "meat orientated" ground fish. Or they may be attached in any position on the inside wall of the aquarium and provide ideal nourishment for fish of the middle water levels. This feeding method creates an excellent opportunity to observe the fish which immediately crowd greedily around the tablet attached to the wall. 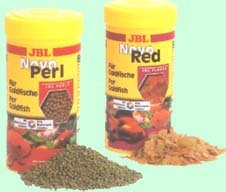 The green feed tablets JBL NovoFect are especially suited to the needs of the more "plant" orientated ground fish. Like JBL NovoTab, they can be attached to the side of the aquarium, adding a welcome variety to the diet of plant eating fish of the middle water zone. With a high proportion of plant fibre, they ideally meet the nutritional needs of sisorid catfish. JBL TABIS high quality fish feed tablets are a special treat for all types of aquarium fish, introducing additional variety to the diet. The high spirulina and krill content of JBL TABIS provides valuable minerals, carotenoids and unsaturated fatty acids for healthy growth and brilliant, natural colouring. JBL TABIS can also be attached to the side of the aquarium, if desired. JBL TABIS fish feed tablets are a special treat for all types of fish. JBL Novo flaked feed for surface fish and fish of the middle water levels. JBL Novo-sticks M are specifically designed for larger aquarium fish like chiclids and other. JBL TABIS are specifically designed for fish of the middle water levels and for ground fish. JBL Novo Fect especially for ground eating fish. 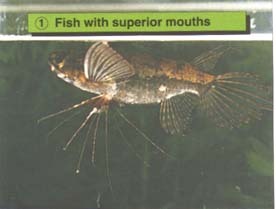 In addition there are differences in the sizes of fishes' mouths. JBL therefore produces differing sizes of flakes: large flakes, medium sized flakes and small flakes the right size for each mouth. Some fish dislike flaked feed and prefer feed in "crumb" form. For this group the JBL range also includes different types of feed for all sizes of mouth, from small to large. JBL Grana, a granulate feed, offers small fish a suitable form of nourishment with high nutrient content. Characines usually need JBL small flakes because of their small mouth. 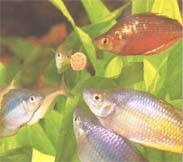 The gourami feeds on medium to large flakes according to its size. By both sinking and floating, this feed meets the needs of fish of the higher and middle water levels at the same time. JBL Grana Cichlid provides "bite sized" pieces for small and medium sized cichlids and other meat loving fish of this size. For large meat eating cichlids and other species of large fish, JBL has developed NovoStick M, a mouth sized stick designed to meet the special needs of this group of fish. JBL feed in �crumb� form. Goldfish have been developed by breeding from Prussian carp, a member of the carp family. Since carp are herbivorous fish, feed for goldfish should contain sufficient quantities of raw plant material. The special needs of herbivorous cold water fish should be taken into consideration in the processing of wheatgerm and algae. The flake feed JBL NovoRed and the feed pearls JBL NovoPerl are ideally suited to meet these requirements. The newly designed form of JBL NovoPerl as a pearl shaped feed specifically corresponds to the feeding habits of goldfish. 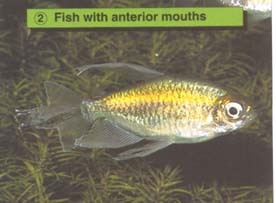 Many of the popular fish which have been developed by skilful breeding from goldfish e.g. fantails, lion heads and others require a specially adapted feed. Due to the changes brought about by breeding, the nutritional needs of these fish are no longer the same as their herbivorous original form. In order to maintain healthy long fins and other special characteristics, the fish require additional proteins, wheatgerm and algae. 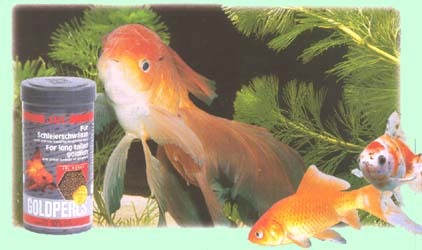 High grade JBL GoldPerls feed provides all the nutrients these fish need and promotes healthy, vivid colouring. Algae eating cichlids from the African lakes of the Great Rift Valley, e.g. tropheus breeds, require specially adapted feed containing as few animal ingredients as possible. JBL NovoRift consists of 90% raw vegetable material, providing healthy feed for this group of fish. The ministicks, which slowly sink in the water, are ideally suited to the feeding habits of these fish. 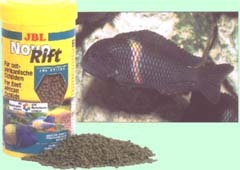 The king of aquarium fish requires a feed specially designed to meet its needs. JBL Grana Diskus is a high-grade feed comprised of special granulates which slowly sink in water and are ideally suited to meet the feeding habits of "His Majesty". Vital unsaturated fatty acids and carotinoid promote natural brilliant colouring. Two types of feed from JBL's high grade range contain a mixture of ingredients which are specifically designed to meet the requirements of marine fish in an aquarium. In addition to valuable vegetable components, JBL Maris, a flake feed, also contains 30% krill flakes, eaten with relish by marine fish. 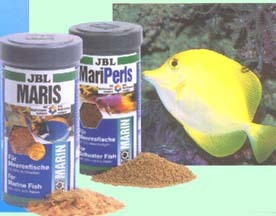 JBL MariPerls, in mini pearl form, contain precious seaweed, providing algae eating fish with nutrients in an ideal form. The size of the pearls, which slow sinking in the aquarium, is specifically suited to the eating habits of most marine fish.